The property is surrounded by thick and luxuriant ensuring great privacy and discretion. It enjoys wide shaded areas thanks to the surrounding tall maritime pines. On the side of the villa, in the 5.125 mq wide private park, it has been built a big pool, enlightened by the sun all day long. The solarium area, surrounded by tall hedges, has tables, sofas and sun beds, where you can relax during the hot afternoons or the cool summer evenings. The dream house's special feature is undoubtedly the finely furnished panoramic terrace. Here you can enjoy the breathtaking view over the gulf and the tall trees and the blossoming azaleas. The property develops on three floors and is 369 mq wide. A brick spiral staircaise with wrought iron handrail leads to the upper floors. The living area has a lunch room, the kitchen, two elegant studios, two living rooms and a ironing room. The sophisticated furniture, fabrics and colours reveal the infinite attention to details. The sleeping area is made of six bedrooms, some of which ovelook the sea, and seven bathrooms. 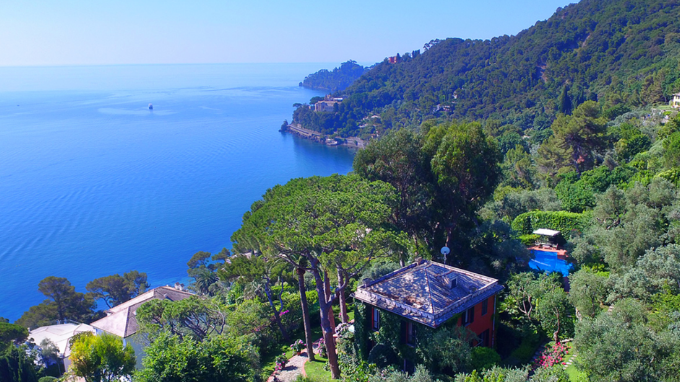 This romantic, exclusive and cosy villa for sale in Liguria is a real dream house, from which you can fully appreciate the stunning panorama over the stretch of cost. A very trendy location and an absolute beauty, the Ligurian Riviera extends from Monaco to Capo Corvo, crossing the four provinces of Savona, Imperia, Genoa, and La Spezia, with a total length of about 330 km. Overlooking the beautiful crystal clear Ligurian sea, the Riviera is divided into the Riviera di Levante and Riviera di Ponente. The first is characterized by the presence of sandy beaches interspersed with rocks and cliffs that jut high above the sea. There are many places of tourist interest, such as Camogli, Portofino, the Tigullio Gulf, the Cinque Terre, Lerici, Porto Venere and il Golfo dei Poeti. The Riviera di Ponente, also known as the Riviera dei Fiori, is rather famous for its sandy beaches and deep waters. The main resort towns are Finale Ligure, Sanremo, Bordighera and Menton. A very demanded and sought after area, the Riviera has experienced over the years an increasing number of luxury villas and luxury real estate, designed to meet an increasingly growing demand. This beautiful and exclusive Luxury Villa For Sale in Forte dei Marmi is just a few steps from the Sea, and is surrounded by acres of Gardens and Pine Trees. 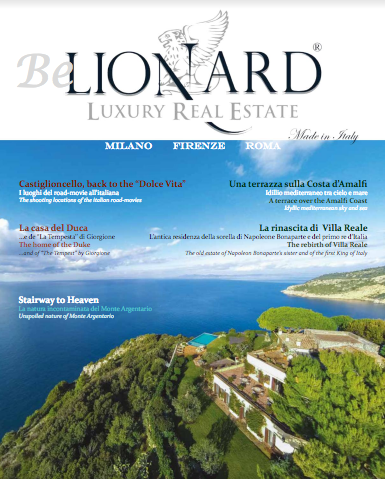 This luxury villa with swimming pool for sale is surrounded by the harmonious colours of the wonderful Ligurian coast.